Tanda Tula is fantastic! 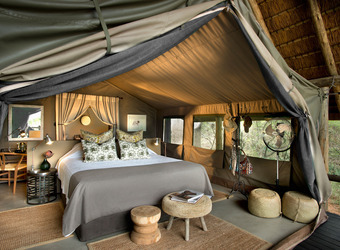 We like tented camps because you can hear everything happening outside, from hippos grazing at night to elephant pulling twigs from trees and lions roaring in the distance. It was remarkable. The camp was just updated - we saw photos when we booked that were a bit more shabby chic, and now it has a classic but slightly more contemporary feel to it. It's not over the top by any means, quite comfortable and lovely. The canvas tents make the experience unique! The owners were there, and all the staff and our guide were excellent. I couldn't recommend a more down to earth but lovely camp, and we hope to return someday!